Earlier this week I was greeted by a man at the gym. He wished me a happy Chanukah 5768. Mind you he pronounced it as if he we saying Charlie. So it was closer to Cha-Noo-Kah 5768. I wanted to ask him if it was related to Love Potion #9. Don't ask me why, because I don't know. So now after having suffered the consequences of having consumed far too much brisket and having eaten too many latkes and sufganiyot I present you with your virtual Chanukah gift, Haveil Havalim #144. Read and enjoy. Please feel free to promote this on your blog too. Remember if you don't, you have to appear on this show. P.S. My apologies for not including any waffles on the menu. The Waffle King has been really busy lately. P.P.S. My apologies for the formatting. There is an issue and I just don't have the time to correct it. We have a whole slew of posts about Chanukah. If I have done my job correctly the collection is listed just below. Should we start with some Seasonal Music. Or perhaps you'd prefer to discuss Chanukah's impact on the environment. Check out Environmentalists "encouraging Jews around the world to light at least one less candle this Hanukka to help the environment." See Shira's take too. Our own Jewish Blogmeister has his own environmental suggestion for Chanukah. How about A Little Treyf In Your Chanukah Stocking? Muse presents On the Eve of Miracles. Miracles are covered all over. Ask Ezzie about Small Nisim and Small Packages. Seraphic Secret offered Chanukah in Iraq' Good wishes are being offered all around Soccer Dad says Chanuka Sameach and Schach says Chag Chanukah Sameach. Rav Neil Fleischmann presents 3 HOTD + and On Chanukah. Gail offers Chanukah: The Freedom to Choose Morality. A Simple Jew has a Guest Posting By Rabbi Dovid Sears - The Breslov Mesorah. abakaSHEE mahMOW or Abcaxi Mamao shared Chanukah Reflections. Elder Of Ziyon provides entertainment with the Al Qaeda Chanukah Dancers. Westbankmama shares A Little Bit of Good News for Chanukah. Dov Bear wonders How many of you believe the oil miracle occured exactly as described on shabbat 21b? Muse presents How do You Light Your Chanukah Menorah? It makes me wonder. How do you say "cattle rustler in Hebrew. Maybe I'll ask Mottel. After all, he shared A Cowboy Chanukah. Schvach Yid presents Happy Birthday. Rafi G presents Banning a wedding with mixed seating. Rav Neil Fleischmann presents YouG-d. Mottel presents The Kherson Geniza Unplugged. Schvach Yid presents The Sinews of Peace. frummy twelvestep presents Who's in The Driver's Seat? AlexH presents The Kingdom of Joseph. Here is a question you might wonder about: What the Rabbi and Britney Spears have in common. On the Fringe shared Onan's sin: Marital sexual abuse. Frum Satire provided a useful guide to hats. Jacob Da Jew shared a riot. Mere Rhetoric reports that Hamas/Fatah say that compromise on Jerusalem is Treason. At the Augean Stables you can read Humiliation and Apartheid: On how NOT to make Peace. Smooth Stone shared the results of a Poll: Most Israelis Want Olmert To Quit. Yid with Lid has similar feelings: We need a Maccabee NOT AN OLMERT. He also shared Throw the Arabs out of Israel--Its Abbas' Idea! and Olmert YOU ARE NO BEN-GURION. Planck's Constant blogged about why Why Palestinian Children Die. Daled Amos shared Terrorists Demand Get Out Of Jail Free Card. Yael wonders Saudi Arabia and Egypt in bed with Hamas against Abbas? If there is one thing that Israel has problems with it is their appallingly bad public relations. One thing you have to say about Israel, it is never boring. Did you hear that Hanukkah Cancelled by Israeli Supreme Court. Or maybe you want to check Baruch Who presents You devil not to mention a question Iz Shver Tzu'zayn a Terrorist. Israel Matzav wonders Bush to visit Jerusalem; Will he lay a wreath at Arafat's grave? Yisrael Medad presents Pay-As-You-Go Zionism. Ben-Yehudah presents Nahshon's Flag. Don't Buy Sarah a subscription to the Jerusalem Post. If she is not reading the paper maybe she can help Rafi who wonders Where the heck am I? The Waffle King notes This Ain't Your Bubby's Burka. Joe Settler says We Have Got Cars. One Jerusalem provided Our Lovely Little Apartheid State. Fiery Spirited Zionist reports Anti-Zionist Thugs Threaten Wayne State. This is not the sort of breakthrough we were hoping for. According to the Astute Bloggers"IRAN IS A BLACK HOLE." At Israpundit you can read Israel, Iran: The NIE and the Spoiler Process. Boker tov, Boulder! says The Jews Lose. Israel Matzav presents Last nail in the alliance against Iran? The Hashmonean has his own thoughts about Iran: Pax-Americana: Mighty empire humbled by primitive looking Iranian man. Tel Chai Nation shared John Bolton takes on the NIE. Shrinkwrapped offers What Iran's "Victory" Means. SnoopyTheGoon presents Muqtada al-Sadr: young and restless and Democracy - win in Venezuela, defeat in Russia. 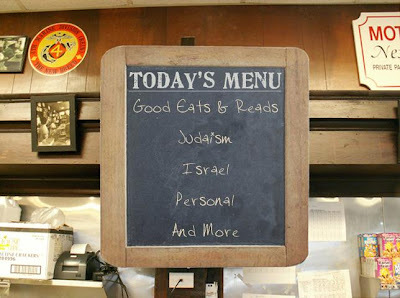 Jewish Atheist blogged about Mitt Romney and Atheists. Elisson wrote about Romney too. Soccer Dad presents Deadly Bombing in Paris. Our resident blogging couple has a story that they both covered: muse called it Legendary Evening Or you can see what Yisrael Medad thought about The Film "Refusenik"
At Adloyada you can read British Media Zionist Conspiracy Derangement Syndrome:A Virtuoso Display. The Town Crier presents Steve Sheffey Guest Commentary: DEMOCRATS & ISRAEL. Solomonia commented: CAIR: 'a turnstile for terrorists and their supporters'. Aussie Dave reminds us that sometimes there is No Escape. Ran'anana Ramblings has a few things to say about the U.S. in What's wrong with America today, in a nutshell. Speaking of the states grab your umbrella and read MizEllie presents Adrift Seattle-Style. Some people think that change is possible. Read more at Yes! We Can Change The World! You might even receive: A Bonus. If Chanukah was any longer I might need therapy. Maybe I should read TherapyDoc's Guys & Dolls and Couples Therapy. Remember I wrote a post called Do You Stand "In Line" or "On Line." Well maybe you should read Rav Neil Fleischmann's On Line. Help! I Have a Fire In My Kitchen offered The Magic And Mystery Of Challah. As a point of reference you might want to read Juggling Frog's Virtual Challah making post. I know the answer to the question Orthonomics asked Retirement: Goyish? Or Jewish? Lion of Zion has a Speed Demon in the family. Mochassid is feeling old. Robert Avrech covered Pearl Harbor day. Bookworm shared Irving Berlin and Churchill. Psychotoddler lists his next few performances. Life of Rubin discovered The Most Baddest English found in Jewish Music PR. Go wish Elie a Happy Birthday. Have you ever heard of The Law of the Garbage Truck. Chana blogged about Privacy. That concludes this edition. Submit your blog article to the next edition of haveil havalim using our carnival submission form. Chappy Chanukkah! Yeah, I don't like that either. BTW... How 'bout "gonev baqar" in Hebrew for cattle rustler? Great job and thanks for the link! holy shnikey, beautiful edition Jack! Thank You. Looks like I better start eating breakfast :) - Hag Sameach & break a waffle iron! How fast do you read? So many posts! I appreciate the link. I'm being spleened for spelling it, Chanucha, and I don't even know why I spelled it Chanucha, but now, the world over, the error will be repeated and there's simply nothing to do. This is as good as it gets. Chag sameach. Thanks. Your submissions were a big part of it. A Frielachin Hanukah to you too. Thank Jameel, I am but his lowly assistant. I read faster than most people and sleep less. Still haven't found a way to turn that into more money, but I am looking. No worries.Chag Sameach to you too. Greaaaaaat Job! Happy Chanukah. Thank you. Great job and thanks for the link. And what do you think of Obadiah Shoher's arguments against the peace process ( samsonblinded.org/blog/we-need-a-respite-from-peace.htm )? Great Carnival, Jack. Kol hakavod! I'm always flattered when you yank one of my posts and stick it in HH, even though I'm too lazy to submit it via the normal channels. And to the last set of commenters a hearty thank you for your participation too.